Watching Time Stands Still is to witness a relationship cracking apart, as two people whose entire shared experience has consisted of an adrenaline rush that can’t be sustained, irrevocably come off the high. Its success then rests on strong performances rooted in naturalism, and luckily that’s a strength Studio Theatre has perfected. Otherwise, you might be asking yourself why you are watching yet another slice-of-life about relationship woes. Time Stands Still begins in the aftermath of war zone trauma for Sarah, a photojournalist physically battered by an explosion, and James, a reporter psychically wounded. Sarah can’t wait for her body to heal so she can jump back in, photographing atrocity after atrocity despite the nagging moral conflict of non-engagement. James has had enough, and wants a normal life (albeit a “normal” live lived in a nice loft in Brooklyn deconstructing horror movies instead of real-life horrors). This framework might be enough for an exploration of what happens when you repeatedly put yourself in harm’s way for the sake of bringing people news they don’t want to see, but playwright Donald Margulies raises the stakes in pretty pedestrian ways. Relationship woes like infidelity, mid-life crisis and delayed parenting are highlighted. 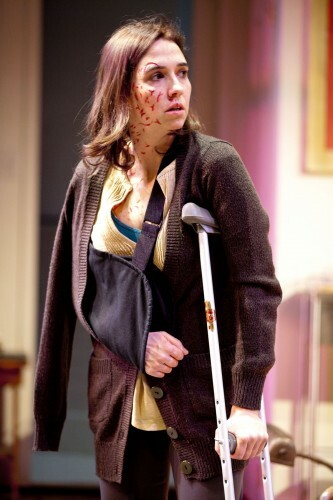 How different the play might be had the core plot revolved around Sarah’s battle to keep her shattered limbs intact, a very relevant and brutal struggle many who’ve been in war zones have faced. Here, you’ll get a rather safe depiction of facial scars that will slowly fade, like the relationship questions we all face and ultimately survive through. No one loses an eye or a leg here in their quest for that beautiful photograph of a baby’s burns after a market bombing. Margulies and director Susan Fenichell are lucky to have four talented actors making the psychic wounds interesting to the audience. Holly Twyford is a master at delivering lines so naturally you’d think they were improvised, and here she gives Sarah an acidic etching – you can almost see her skin bristling with the indignity of being trapped back in her safe apartment while the wars go on without her lens. Greg McFadden subtly telegraphs that James has the relief of the lesser talented partner – back on safe ground, his yearning to a normal couple is really a desire to step into a more traditional, perhaps even dominant role, to Sarah’s brighter star. As their editor Richard and his cute trophy wife Mandy, Dan Illian and Laura C. Harris flesh out what could just have been the stock characters of a May-December romance – the jokes at Mandy’s expense point to the danger of Margulies’ dialogue, dancing at the edge of cliche. Illian and Harris embue them with an inner life. The production design is gorgeous – a Brooklyn loft by set designer John McDermott and lit by Mary Louise Geiger – though the original composition by Eric Shimelonis seemed forced into a horror movie motif, and Sarah’s facial injuries a little too safe. The ensemble acting is the key here, a quartet expert at illuminating inner lives, as they explore the moral uncertainty of making art, making a living, out of the suffering of others. Does that art spur ordinary people to action against atrocity, and if not, is it worth doing? It’s just one question the play asks. There are others the actors ask, in the moments between words. 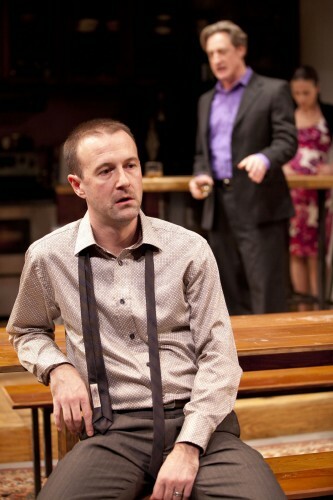 Time Stands Still performs in the Metheny Theatre at Studio Theatre now through February 12. Studio Theatre is located at 1501 14th Street NW, Washington, DC 20005. Closest Metro stop: Dupont Circle (Red line), McPherson Square (Orange/Blue lines), U Street/Cardozo (Green/Yellow lines). For more information call 202-332-3300.